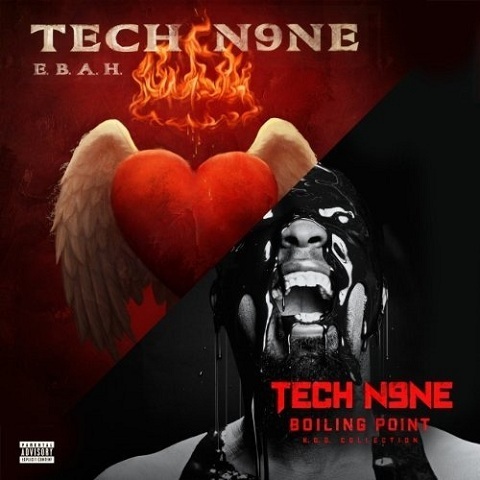 Tech N9ne – ‘E.B.A.H.’/’Boiling Point’ Combo EP Now In Stores! Just in time for the long Thanksgiving weekend comes Tech N9ne’s double-feature of E.B.A.H. and Boiling Point, packaged as one and finally available in stores! Following a record-breaking trek on the Hostile Takeover 2012 Tour earlier this year, Tech N9ne hit the studio and created a two-part journey showcasing the light and darkness inside of him. The end result provided listeners with two separate EPs – E.B.A.H. and Boiling Point. Celebrate Tech N9ne’s astonishing year and hear E.B.A.H. and Boiling Point together for the first time! CLICK HERE TO PURCHASE E.B.A.H./BOILING POINT ON BESTBUY.COM!